I used to love sleepover parties for my birthday when I was younger...as my birthday is near Halloween, we used to tell creepy stories in the dark...EEK!! 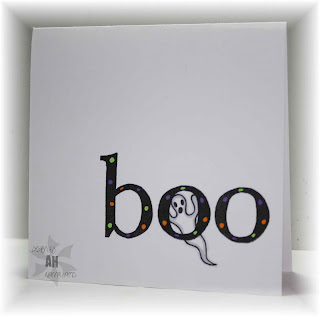 This was the fastest card on the planet...I stamped the letters "boo" (made sure they lined up using my stampamajig), then stamped the ghost inside the "o" (SAMJ again to line it up). I coloured the polka dots in the alpha with orange, purple and green copics, outlined the ghost a wee bit and DONE! !